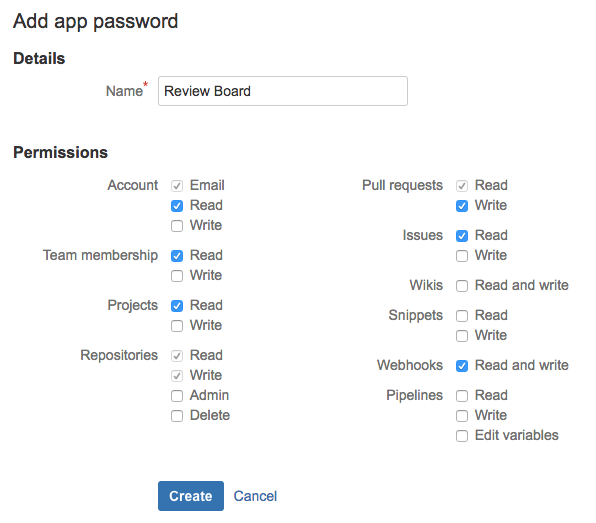 Review Board supports posting and reviewing code on Bitbucket repositories. To configure a Bitbucket repository, first proceed to add the repository and select Bitbucket from the Hosting type field. You will need to link an account on Bitbucket to Review Board, so that Review Board can access content from the repository. If you’ve already linked an account with sufficient access to the repository, you can use that instead. Otherwise, you will need to supply credentials in the Account username and Account password fields. For the Account username field, use your configured Bitbucket username (found in your Bitbucket account settings) and not your Bitbucket/Atlassian e-mail address. The latter will not work. You can use your standard Bitbucket/Atlassian password for the Account password field, or you can use a Bitbucket app password password. We recommend using an app password for enhanced security. This is also required if you have two-factor authentication enabled for your Bitbucket account (which we also recommend). To create an app password, visit your Bitbucket app passwords page and click Create app password. Click Create. You’ll receive an app password. Supply this in the Account password field in Review Board. Next, you’ll need to specify the type of repository in the Repository type field. This can be either “Mercurial” or “Git”. The repository is owned by the linked user account. You’ll need to provide the repository name, but nothing else. The repository is owned by another user account. You’ll need to provide the username of the user and the repository name. Note that your user will need to have access to this repository. This option was added in Review Board 2.5.8. If you’re using a previous version, you can select “Team” instead and provide the user’s username in place of the team name. The repository is owned by a Bitbucket team. You’ll need to provide the team name and repository name. Note that your user will need to have access to this team and repository. For the Repository name field, use the name as shown in the URL. For example, if your repository URL is https://bitbucket.org/myteam/myrepo/, your repository name would be myrepo. If you’re using a separate bug tracker, or a separate repository on Bitbucket, you can leave the checkbox unchecked and choose a bug tracker from the list. You can now choose who should have access to this repository (both posting against it and viewing review requests posted against it). This is separate from Bitbucket’s own access controls. Review Board can close review requests automatically when pushing commits to Bitbucket. This is done by configuring a WebHook and pointing it to your Review Board server, and then referencing the review request in your commit message (which is done for you when using rbt land). Your Review Board server will need to be accessible over the Internet for this to work. Bitbucket will be performing HTTP/HTTPS requests to your server to notify Review Board of new commits. At the bottom of the instructions is a link for creating the WebHook. Click that and follow the instructions on the Bitbucket site.